We had a cold but sunny afternoon for this year’s walk. Around 50 people joined us to enjoy the display of snowdrops. Most blooms are of the single-flowered Galanthus nivalis but we are finding more clumps of the double-flowered version (pictured) every year. 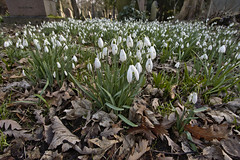 Regular visitors have found what may be another species growing at a grave in the south-eastern section of the cemetery. If it does indeed prove to be different snowdrop we shall point it out on the walk next year. Visitors this February also had the opportunity to see some of our ‘work party’ volunteers in action. They have successfully removed most of the ivy from the Catacomb building so that the fine stonework can be seen once again. Thank you to all the volunteers and visitors who helped make our third Open Day so successful. We counted in 118 visitors but there were many that slipped by while we were chatting to others! Download the full report. We have added a new section to the website showing notable graves on an interactive map and pages containing further information on the graves. 2016-05-09 - Successful Grant Application! 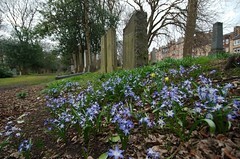 Friends of Newington Cemetery recently applied for a grant from South Central Neighbourhood Partnership (SCNP), one of 12 such partnerships set up by Edinburgh Council. Last year we received a grant to cover the cost of our new sign, for which we were very grateful. This year, grants were decided on the basis of a system called Participatory Budgeting, in which local residents voted on projects which have been submitted to SCNP. The vote was on 30 April 2016. There was a total budget of £24,000, and SCNP received 21 grant applications, totalling £36,524. Friends of Newington Cemetery submitted an application for £2190 to re-erect the beautiful Fallen Angel in the roundel near the main gate of the cemetery. 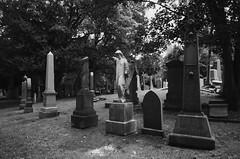 The roundel is the most distinctive area that people come across on entering the cemetery. We are delighted that we were amongst the 10 to be granted their full request: and that one of the others was a project to restore gravestones in the Grange Cemetery, submitted by the Old Edinburgh Club. 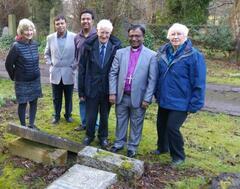 The Bishop of Gujarat (Church of North India), the Rt Revd Silvanus Christian, visited Newington Cemetery on 9 February 2016. 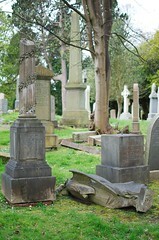 He came to see the grave of the Revd Joseph van Someren Taylor (1820-81). Taylor was originally a Congregationalist, like his friend David Livingstone, with whom he shared rooms when a student in Glasgow University. Born and brought up in India, and from childhood a speaker of three Indian languages, he returned there in 1848 as a missionary of the London Missionary Society (LMS) in the Gujarati-speaking area of the Bombay Presidency. A much-loved missionary, he became an authority on the Gujarati language, of which he wrote – in Gujarat - a pioneering grammar. He was also the author or translator of many books, and a poet of Gujarati hymns (written for Indian melodies) which are still widely sung. When the LMS withdrew from Gujarat in 1860 he decided to stay on, and became a minister of the Presbyterian Church in Ireland (PCI), which already shared the work of the area. He died when on leave in Edinburgh in 1881, and is remembered with affection and respect in India. The mission work of the PCI in 1900 united with others to form the Presbyterian Church of India, which in turn united with the Congregationalists in 1924 to form the United Church of Northern India (UCNI). The UCNI united with a wide variety of other Churches (including Anglican and Methodist) in 1970 to form the Church of North India – the widest union of Christian churches anywhere in the world. Both the Church of South India (1947) and the CNI accepted the ministry of bishops (operating “in council” with their ordained and lay colleagues). The Gujarat Diocese is one of 26, and its borders coincide with the linguistic area of the Gujarati language. The CNI is a member of the world-wide Anglican Communion, as also of the World Commission of Reformed Churches and the World Methodist Council. Bishop Silvanus, who himself comes from the Presbyterian tradition – unlike his predecessor Bishop Vinodkumar Malaviya, whose background is Anglican - had just been attending a training conference in Canterbury for newly consecrated bishops from the worldwide Anglican Communion. 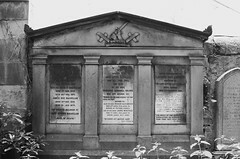 The group which came to the Cemetery, which included representatives of the Irish Presbyterian Church, and a member of the Newingtom Cemetery group (Robin Boyd) with his Anglican wife Anne Booth-Clibborn, went directly from the Cemetery to attend a meeting of the Church of Scotland’s Commission for World Mission. The Bishop was accompanied by Mr Percy Patrick , a member of the CNI who is working in Glasgow for the Roman Catholic relief organisation SCIAF (Scottish Catholic International Relief Fund), whose son Rohan acted as driver to the party. It was a very ecumenical meeting of friends of Gujarat! As the Friends of Newington Cemetery carry on their improvement work fascinating new information continues to emerge about the graves and their occupants. 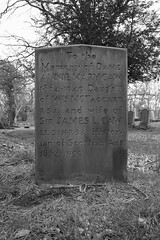 When Doors Open Day 2014 featured the graves of the artist William McTaggart and his extended family, the wording on one stone led visitors to enquire about the burial of McTaggart’s son-in-law, the art historian and curator Sir James L. Caw. This led Friends volunteer Dennis Smith on to a trail of research which ended with the recent publication of an article in the Book of the Old Edinburgh Club. Download the full article which is reprinted with permission from the Book of the Old Edinburgh Club, volume 11, 2015. We now have a News and Events page so you can keep up with what is new and what is going on.